SharkVac is the newest innovation to the TigerShark family of Robotic pool cleaners. SharkVac by Hayward incorporates two fine porosity filtration elements in a sleek floor-specific design. With its unique top access debris chamber and filtration cartridges, there is no need to turn the cleaner upside down (like all other Robotic cleaners) or hassle with cumbersome and messy bags. Hayward SharkVac is a robust Robotic pool cleaner that is gentle and compatible with all types of pool surfaces. Its scrubbing brush will even work away the most stubborn dirt. Designed with enhanced technologies, SharkVac by Hayward is one of the most economical pool cleaners to operate - equivalent to the energy used by a standard light bulb. 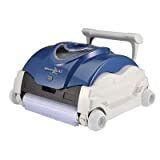 Hayward RC9740 SharkVac Robotic Pool Cleaner 4.0 out of 5 based on 95 ratings.